It's a glorious day at the end of a glorious week of real warm spring sunshine - and of course, I'm stuck inside glued to a computer. But if I get tired of gazing out the window at the pastoral beauty that is the Fulwood Industrial Estate in spring (unlikely as that sounds), I can take heart by admiring the work of some of our own photobloggers. 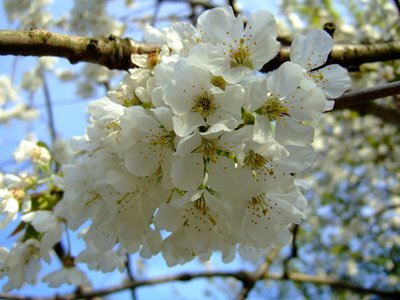 Island Monkey and slow|afternoon, and Roy at Mantex have posted the most gorgeous pictures of blossoming trees, fresh trembling leaves and springing turf. This photo above is one from Island Monkey. Anyone else got good spring snaps? Enjoy it now, because the weekend is going to be crappy. Sigh. Of course it is. Hey thanks for the mention. It's true the last few days have been absolutely glorious. I'll be returning to more uplifting photo blogging soon once I have got my current surge of political angst out of the way..